We are in the process of moving from onsite Exchange to G-Suite for email. In the past we bounced all external email through Gmail before it hit our Exchange server as a backup and spam filter. As a result, everyone's Gmail inboxes are loaded with external emails and they are all unread. Before I move all users to Gmail I would like to clear out all those emails for all staff, so they get a fresh inbox. Is there a way I can do this without logging into everyone's accounts? I have well over 100 accounts to clear. I wouldn't suggest deleting these email as the users will not have access to any historical email they sent. I know I'd be F$js%j if I found out all my email is gone. I would suggest pushing a filter to all your users that archives these messages out of the Inbox view. If email isn't really important I would then just delete all your accounts and create them again. The time to do this would be much faster than either the option above or below. 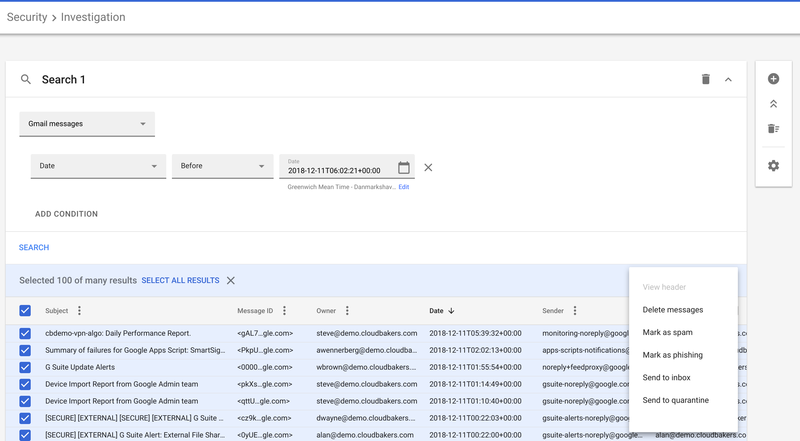 If you must delete messages in the accounts then you can use the built in Security Investigation Tool that is available on G Suite Enterprise. Not the answer you're looking for? Browse other questions tagged gmail g-suite or ask your own question. How do you blacklist an email sender in Gmail? How to send messages from Gmail using my Outlook.Office account?